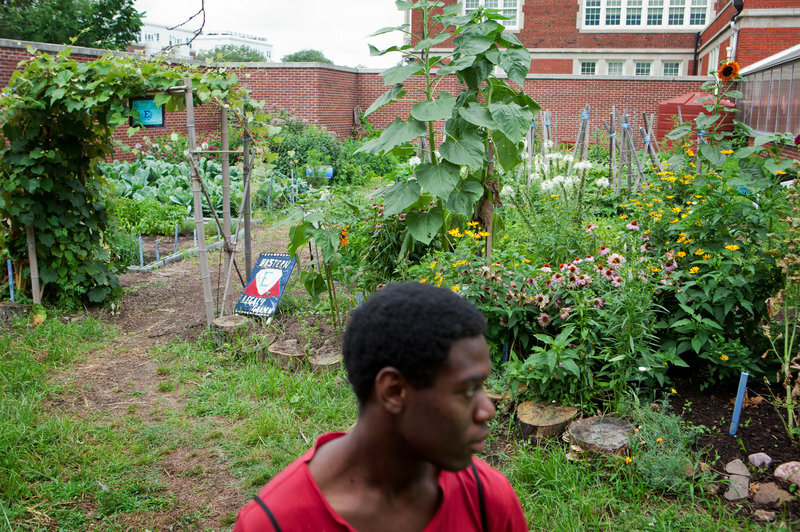 Tall brick walls conceal a colorful garden at Eastern Senior High School in Washington, D.C., where students like Romario Bramwell, 17, harvest flowers and produce. The program is run by City Blossoms, a nonprofit that brings gardens to urban areas. School is still out for the summer, but at Eastern Senior High School in Washington, D.C., students are hard at work — outdoors. In a garden filled with flowers and beds bursting with vegetables and herbs, nearly a dozen teenagers are harvesting vegetables for the weekend's farmers market. Roshawn Little is going into her junior year at Eastern, and has been working in this garden for three years now. "I didn't really like bugs or dirt," Little says, thinking back to when she got started. "Well, I still don't really like bugs, but I like the dirt," she laughs. 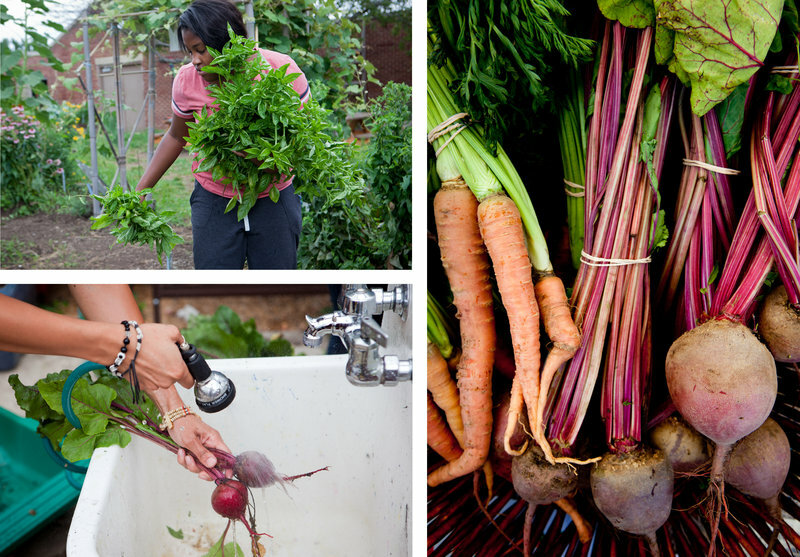 She gathers a handful of greens, yanks from the stem and pulls up a baseball-sized beet. During the summer, Little gets paid to work Tuesday through Saturday from 9 a.m. until 2 p.m. with City Blossoms, a nonprofit that brings community gardens to schools, community centers and other places where kids gather in urban areas. 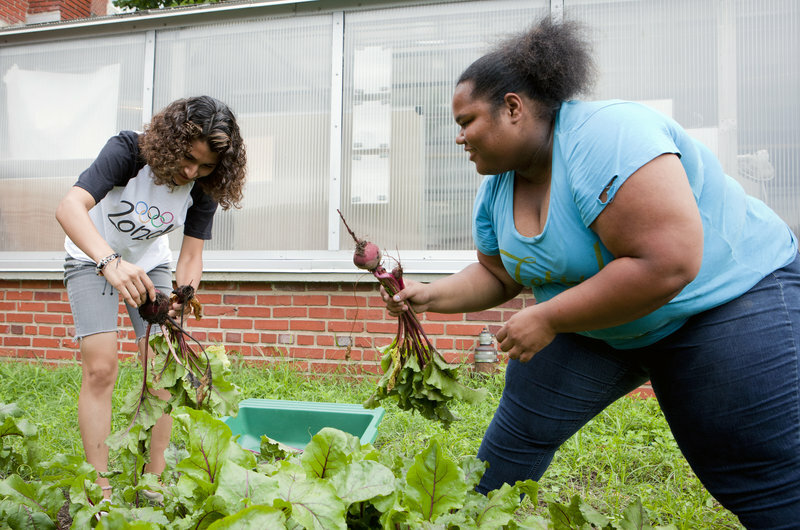 Yanci Flores (left) and Roshawn Little harvest beets from the garden at Eastern Senior High School on July 17. Little believes that working in the garden has taught her to try all sorts of new things — like eating different kinds of vegetables more often. And she's taken those healthy behaviors home with her. Little brings home vegetables from the garden, and she says her eating habits have encouraged her family to buy more fruits and vegetables. "We're a chubby family and we love to eat. Well, I do," she adds with a laugh. "We mainly live around liquor stores and snack stores. There aren't that many grocery stores. They're way out, and you have to drive so far" — a common problem in low-income urban areas. "It seems so pointless, when there are snack stores right there," she says. City Blossoms is one of many groups across the country teaming up with local communities to install school gardens, like the one at Eastern, in areas with low access to fresh, healthy foods. These gardens, advocates say, are really outdoor classrooms where kids learn valuable lessons — not just about nutrition, but also about science and math, even business skills. Many of these groups have big ambitions to tackle complex problems. But there is research that shows the benefits of school gardens can be real and measurable, says Jeanne McCarty, the executive director of REAL School Gardens. "There's a trend across the country where kids are not spending enough time outdoors, period," McCarty says. To counter that, the nonprofit, which operates in Texas and Washington, D.C., Maryland and Virginia, works with schools to create "learning gardens" and trains teachers on how to use them to get students engaged and boost academics. For example, the gardens can be used for math lessons — like calculating the area of a plant bed — or learning the science of how plants grow. 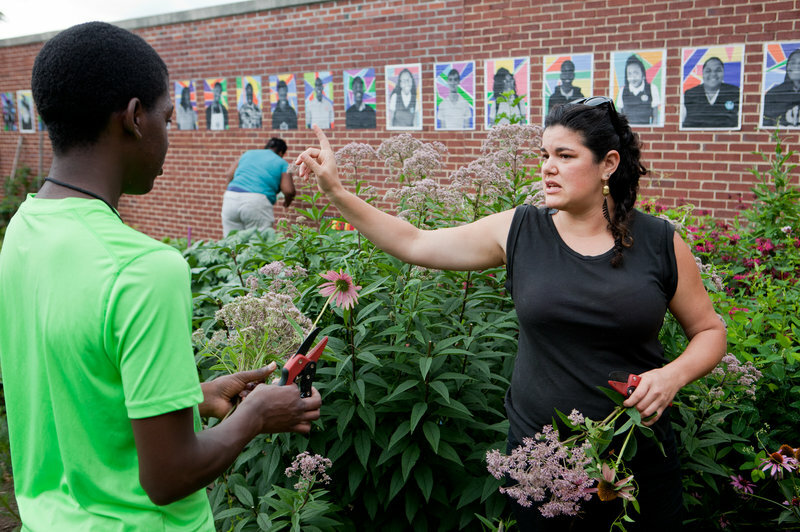 McCarty says REAL School Gardens — which has built nearly 100 gardens — is constantly evaluating the outcomes of its programs, and the numbers are encouraging. She says partner schools have seen a 12 to 15 percent increase in the number of students passing standardized tests — not just those in the garden program, but schoolwide. 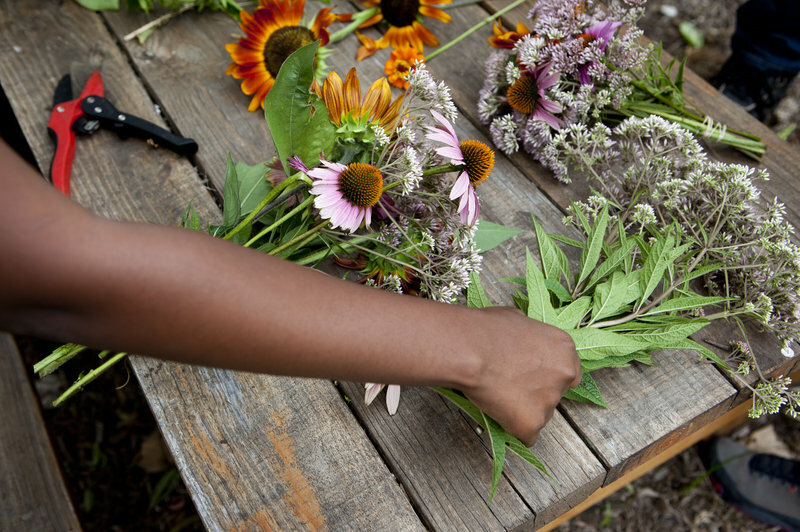 Students at Eastern Senior High School in Washington, D.C., trim bouquets to sell at the farmers market. And 94 percent of teachers in the REAL School Garden programs reported seeing increased engagement from their students, according to an independent evaluation conducted by PEER Associates and funded by the Rainwater Charitable Foundation. She says the benefits don't end with the students, either. Schools that installed learning gardens saw less teacher turnover, McCarty says. Principal Margie Hernandez tells us she's seen the effect firsthand……. 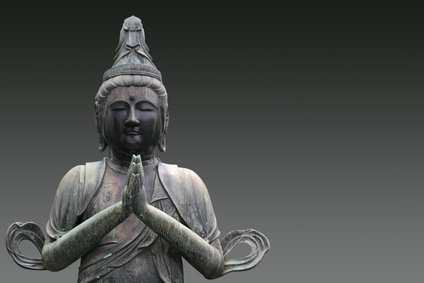 …..among her teachers. "They start realizing that they need something to invigorate themselves, so they can invigorate their classrooms and invigorate their students," she says. Her school, Pershing Elementary in Dallas, has worked with REAL School Gardens since 2011. And for her students — who come from predominantly low-income backgrounds — the experience can be a nutritional eye-opener, Hernandez says. "It totally changed my kids' perceptions of where food comes from, and what it takes to produce food." If They Grow It, They'll Eat It…. Many studies have found that kids are more likely to eat fruits and vegetables if they help garden them. That's part of the motivating principle behind Colorado-based Denver Urban Gardens, or DUG, a school garden program that puts a heavy emphasis on having kids taste the produce they grow. DUG has 13 garden programs at schools where more than 90 percent of the students qualify for free and reduced-price lunches. Some of the produce that students grow then gets sold to the school cafeteria. That way, kids can recognize the fruits (and vegetables) of their labor in the lunch line. DUG has found that 73 percent of the students who work in the school garden reported increasing their actual consumption of produce. Homemade signs decorate the table at the Aya farmers market, where the kids of City Blossoms sell their produce on Saturdays. Rebecca Andruszka, who works with DUG, says her friend's children will only eat vegetables from the garden at school — not from the grocery store. "I think it's just that it seems less foreign when you're a part of the growing process," Andruska says. 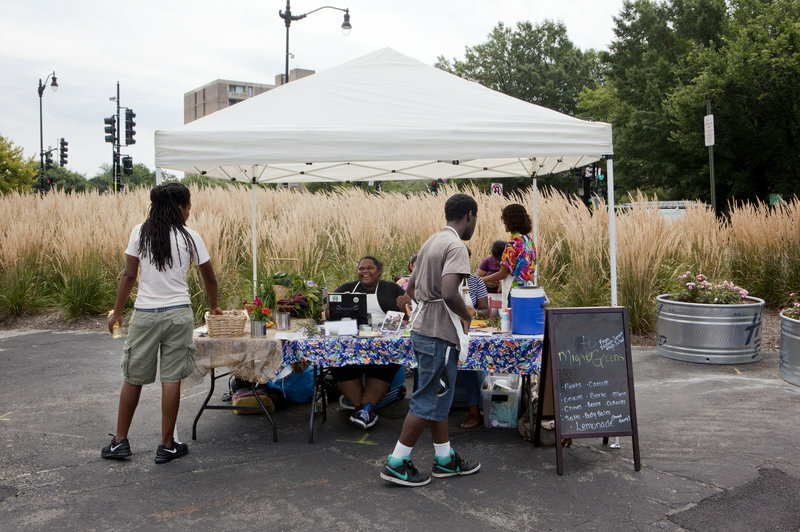 In D.C., the kids of City Blossoms are also part of the business process: They take their produce to farmers markets. 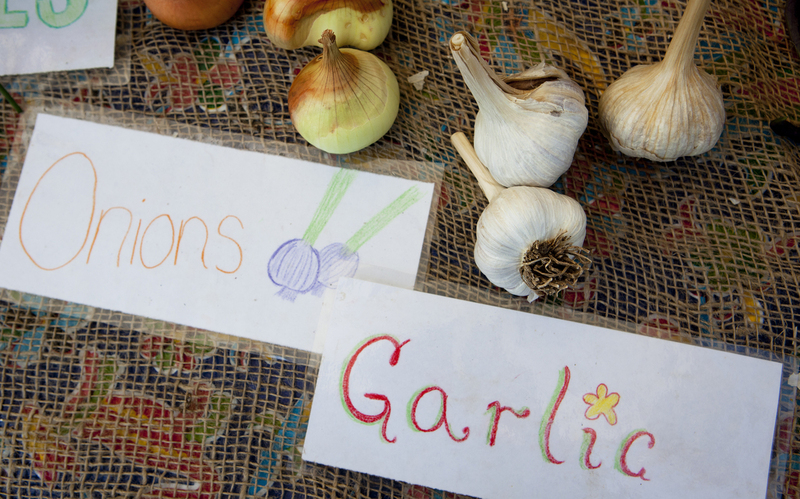 On a recent weekend at the Aya farmers market in Southwest D.C., the kids' table is decorated with handmade signs that read "onions" and "garlic," with little pictures drawn beside them. The kids greet customers warmly, shaking their hands and calling them "sir" or "ma'am." Roshawn Little mans the table, inviting people to try their herbed salt with bread. Working at the market has helped her practice her public speaking skills, she says. Plus, it teaches her business and money skills. 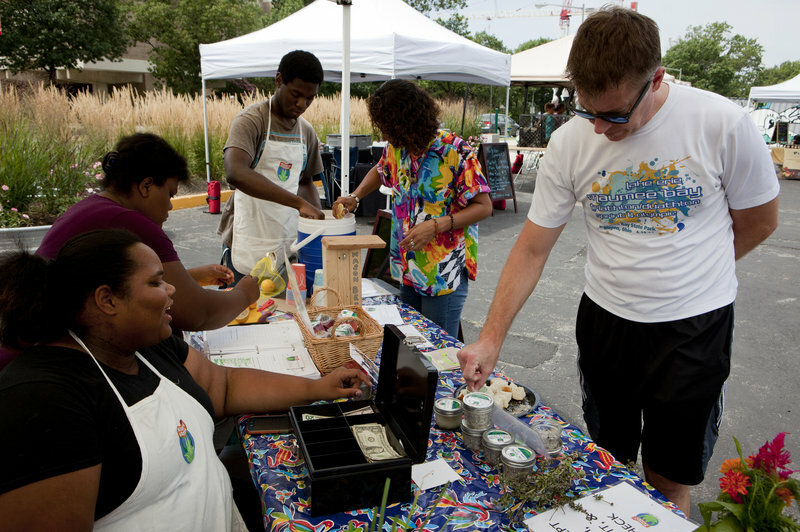 Roshawn Little (left) invites customer Nate Kohring to try the herbed salt with bread at the Aya farmers market on Saturday. "I used to spend money on anything, mainly junk food," Little says. "Now, as I'm working here, I learned how to use my money more responsibly." Nadine Joyner of Nutrition Synergies LLC, a nutrition education company, has a booth next to the kids at the market. She often buys produce from them to incorporate into her quiches. She says she's constantly impressed by the kids' knowledge of what they're selling — they know how to grow it, how to prepare it, and how to cook it. "It's a very impressive thing to see young urban entrepreneurs," Joyner says, looking over at the kids. "It's a refreshing thing." Joyner believes that teaching young people the importance of healthy eating will have long-term payoffs. "The payoff is exponential, because they'll be young mothers or young fathers someday, and they'll feed their children based on what they've learned now," she says. But the kids aren't thinking of that bigger picture. Instead, they're just enjoying the little things, like the way their hands smell after harvesting herbs, or the satisfying crunch of a freshly picked carrot. Article copied word for word, with original photography from an article I found on NPR.org website. Copyright Disclaimer: Right to use article and photos claimed under: Section 107 of the Copyright Act 1976, allowance is made for fair use for purposes such as criticism, comment, news reporting, teaching, scholarship, and research. Fair use is a use permitted by copyright statute that might otherwise be infringing. Non-profit, educational or personal use tips the balance in favor of fair use. This is a fantastic venue for kids on all kinds of levels. They have the opportunity to learn from Mother Nature herself and become healthier and wiser in the process. I am wondering if there is a similar organization that works with schools in the Pacific Northwest. Does anyone know? I expect to see this kind of learning take off and end up all over the country, preferably sooner than later. Thanks for the great post, Doug. Rock on!